intersect feature or the zoom and trace features of the graphing utility to find the points of intersection. 71.99999999979796) is. 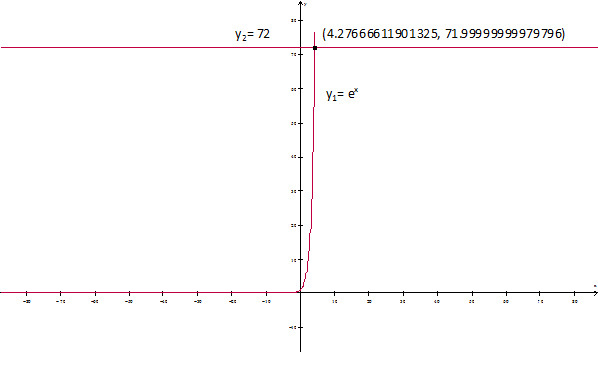 Hence, an approximate solution is x≈ 4.28.
approximate solution is x≈ 4.28. 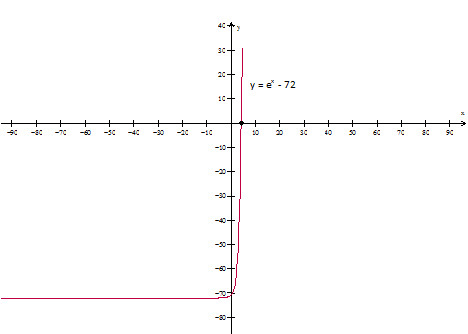 Below is an illustration of how an exponential function table looks like. The exponential function table provides the approximate values of an exponential function. Thus, in order to find an approximate solution all you need to do is search through the table. To find the approximate solution for the previous example ex = 72, we will use the following table. Since ex = 72, we need to choose which value of ex from the table is nearest to our given equation. And so, we have three options, x = 4.27, 4.28, and 4.29. Compare the values of ex . The value of ex that is closest to the given equation is 72.240. Thus, an approximate solution is x≈ 4.28. C 2.02. Using a graphing utility it is easy to find the approximate solution for 5x = 26.
you will find that .690734 as the closest value and x = 0.37.